The Eloquent Woman: Famous Speech Friday: Robert Kennedy on the death of Martin Luther King, Jr. 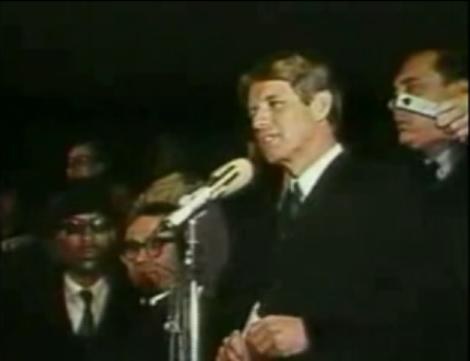 Famous Speech Friday: Robert Kennedy on the death of Martin Luther King, Jr. If I'm going to blow up the rules for Famous Speech Friday, it will be for this speech. I saw it broadcast live 45 years ago, and it stands among the best impromptu speeches I know. Normally, this series brings you famous speeches by women, but I find myself unable to let this one pass unnoted this week: Yesterday was the 45th anniversary of the speaker's own assassination, an indelible memory for me. Anyone might follow this speech, which deals with the minutiae of the moment and hints at a larger vision of what this means for America. It quotes Aeschylus but stays close to the emotions of the crowd. It's a quiet speech, not at all anxious, but appropriate in its sadness, regret and respect for the events of the day. Speak from your heart, not from your notes when the moment is tense and emotional. You can see Kennedy fidgeting with what must have been notes--he had a plane ride's worth of time to craft notes in between learning that King was shot and learning that he'd died--but this speech didn't rely on them. Heal with the song of poetry: Kennedy calls this his favorite poem, and the Greek poet he quotes blessedly translates into the simplest words: Even in our sleep, pain which cannot forget/falls drop by drop upon the heart,/until, in our own despair,/against our will,/comes wisdom/through the awful grace of God. In effect, he's letting the audience offload its emotion into the poet's words and subtly reminding them that these powerful feelings are ancient as well as current. And--so like the ancient Greek poets-- the poem is bracing and forthright, not maudlin and weepy. It fits the moment. This also works because Kennedy stays true to himself by sharing his favorite poem, a well-worn, well-known-to-him stanza, one he's unlikely to forget in the moment. Be willing to face the music: A dogged campaigner, Kennedy could have gone ahead with his prepared stump speech, but he even tells the fans "Could you lower those signs, please?" in the first phrases of his remarks. This speech speaks forthrightly about the tragedy, and aims to help the listeners make sense of it in real terms. "In this difficult day, in this difficult time for the United States, it's perhaps well to ask what kind of a nation we are and what direction we want to move in. For those of you who are black -- considering the evidence evidently is that there were white people who were responsible -- you can be filled with bitterness, and with hatred, and a desire for revenge," said Kennedy, laying out the realities. "We can move in that direction as a country, in greater polarization -- black people amongst blacks, and white amongst whites, filled with hatred toward one another. Or we can make an effort, as Martin Luther King did, to understand, and to comprehend, and replace that violence, that stain of bloodshed that has spread across our land, with an effort to understand, compassion, and love." Would that we all could pull ourselves together as speakers in such a moment as this, and so effectively. His words carry all the more power for us today because, two months after this event, Kennedy himself was assassinated. You can read the text of this famous speech and hear the audio here, and the video is below. What do you think of this famous speech?